I have a big fat list going on in my head of things I want to make. As I’ve said before, there are things I am never going to make. Shoes and hats. Nada. But some things are so super easy that I can’t NOT make them. Shrugs are bang on trend. They lend themselves to a light summer cover but I’ve seen heavier woolen winter ones too. 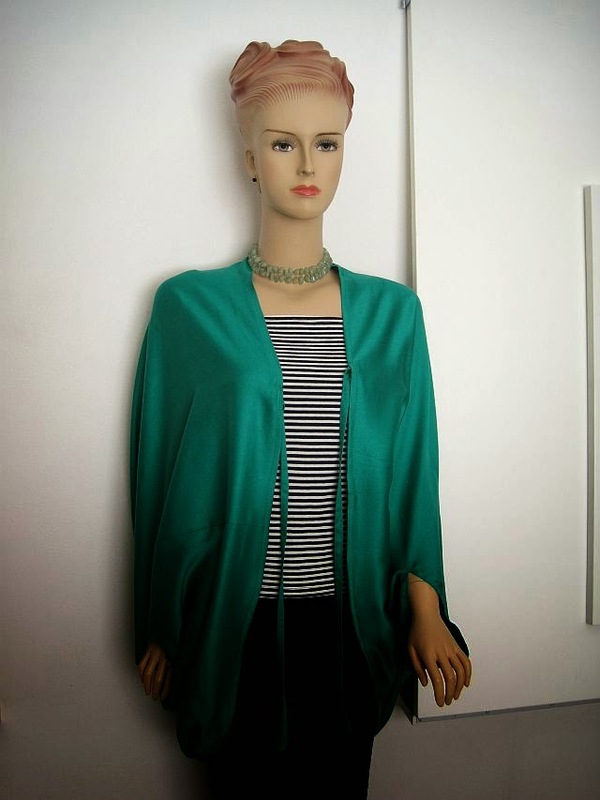 It’s an alternative to a kimono jacket and even easier to make. The trick is to get the proportions right. I saw one in a shop and went straight to the fitting room to try it on. I measured it along my body so I could get a sense of the proportions. Came home, measured against my body and wrote the dimensions down on a piece of paper. And promptly threw the paper away without thinking. Duh! So I tried to cut it from my head – which was a flop. If I have learned anything about sewing. The proportions have to be right. And fabric choice is EVERYTHING. My top 10 sewing tips are – here. I got carried away and dished out 10 more tips which you can find – on this link. A polycotton, cotton knit or soft drape light weight fabric will work for this top. But a warm jersey should also work well for cooler weather. I’m a size medium or UK dress size 10. This is a loose top so likely fit a few sizes either way. Cut the shrug from your fabric using the dimensions from the pattern above. Or make a pattern first and cut from the pattern. I allowed a generous 2 centimetres seam and hem allowance which is included in the above dimensions. Pin the sides leaving open about 17 centimetres on each side for your arms to fit through. Sew and press with an iron. The darts are to create a slight curve on the shoulders. They are not necessary and can be omitted. I placed two darts – one on each side of the centre point of the shrug. My darts are about 8 centimetres long and just over 1 centimetre wide when folded over. You can make your darts wider to create more of a curve. Or add more darts. My suggestion is to pin them first, fit the shrug and see how it fits and then sew them. You always sew darts from the widest part to the narrowest. You can finish by making a hem around the outside – or – and this is another optional bit – you can make ties. Since this is a loose garment I felt it needed ties to hold it closed in front. Cut two long thin strips – about 50 centimetres long and 4 centimetres wide. Fold the strips in half lengthways and press with an iron. Fold the outer bits in like you are making bias binding and press again. Sew flat. Fit your shrug and pin the ties around the bust area. Sew them in place. Now fold over the outer area and sew a hem. Finish by pressing with an iron. And just like that you have a shrug.